How can anthropology advance human emancipation from racism, gender inequality, class disparities, and other forms of oppression? We will consider this question by examining anthropology’s colonial history from a decolonising perspective, rethinking key anthropological concepts and asking what an anthropology for liberation might look like in theory and practice. A number of people have asked me for the list of readings, so here they are. The readings focus on decolonising anthropology and anthropological knowledge, and my lectures will complement this by discussing anthropology for liberation. Teaiwa, Teresia K. 1995. “Scholarship from a Lazy Native.” In Emma Greenwood, Klaus Nemann and Andrew Sartori (eds. ), Work in Flux. Unviersity of Melbourne: Parkville, Victoria. Pages 58-72. Asad, Talal. 1973. “Introduction.” In Anthropology and the Colonial Encounter. Ithaca Press: London. Pages 9-19. Smith, Linda Tuhiwai. 2012. “Colonizing Knowledges.” In Decolonizing Methodologies (2nd edition). Dunedin: Otago University Press. Pages 61-80. Harrison, Faye. 2008. “Writing against the Grain: Cultural Politics of Difference in Alice Walker’s Fiction.” In Outsider Within: Reworking Anthropology in the Global Age. Chicago: University of Illinois Press. Pages 109-133. Tengan, Ty P. Kāwika. 2005. Unsettling Ethnography: Tales of an ’Ōiwi in the Anthropological Slot. Anthropological Forum, 15:3, 247-256. Sissons, Jeff. 2005. “Indigenism.” In First Peoples: Indigenous Cultures and their Futures. London: Reaktion Books. Pages 6-35. Mikaere, Ani. 2011. “Are We All New Zealanders Now? A Māori Response to the Pākeha Quest for Indigeneity.” In Colonising Myths, Māori Realities: He Rukuruku Whakaaro. Wellington: Huia Publishers. Pages 97-119. Simpson, Audra. 2007. On Ethnographic Refusal: Indigeneity, ‘Voice’ and Colonial Citizenship. Junctures, 9, 67-80. Kaʻili, Tēvita O. 2012. Felavai, Interweaving Indigeneity and Anthropology: The Era of Indigenising Anthropology. In Joy Hendry and Laara Fitznor (eds. ), Anthropologists, Indigenous Scholars and the Research Endeavour: Seeking Bridges Towards Mutual Respect. London, United Kingdom: Routledge. Pages 21-27. Muru-Lanning, Marama. 2016. Intergenerational investments or selling ancestors? Māori perspectives of privatising New Zealand electricity-generating assets. In Peter Adds, Brigitte Bönisch-Brednich, Richard S. Hill, and Graeme Whimp (eds. ), Reconciliation, Representation and Indigeneity: ‘Biculturalism’ in Aotearoa New Zealand. Heidelberg : Universitätsverlag Winter. Pages 49-61. Fabish, Rachael. 2014. “Chapter 1. Methodology: ‘Learning to be affected’ by Kaupapa Māori.” In Black Rainbow: Stories of Māori and Pākehā working across difference. PhD thesis, Victoria University of Wellington. Pages 23-60. Loperena, Christopher Anthony. 2016. A Divided Community: The Ethics and Politics of Activist Research. Current Anthropology, 57:3, 332-346. As you can see, we are only going to read one reading per week instead of the usual 2-3 per week that many courses assign. This is so we can develop a thorough, critical understanding of each required reading. I plan to provide a list of recommended readings to supplement the required reading list, which will include authors like Paulo Freire, Franz Fanon, and Edward Said, and non-academic texts such as poetry, fiction and film. What would you recommend I add to this list of recommended readings, and why? I would love to hear your suggestions! Anthropology, a discipline dedicated to understanding the full range of human experience from as many perspectives as possible, has always been comparative. This comparative aspect was one of the things that initially captured my imagination as a student. I became interested in understanding how issues that affect humans everywhere – such as poverty, inequality and development – appear in different contexts. I believe that to better debate such issues, we need to understand people’s practices as well as context-specific structures of history, environment, society, and culture. Careful comparative analysis can add to knowledge about development and social change by informing debates and contributing to more effective policies and strategies. I enjoyed this post by Jay Ruby. I have a somewhat more optimistic view about the future of anthropological cinema though, based in part on the films produced by our 300-level and Honours students in visual anthropology courses taught by Prof. Brigitte Bönisch-Brednich. In fact I’m going to an ethnographic film screening tonight where two of our Honours students are showing films they created as part of their coursework this year. This post has given me lots of food for thought and it will be interesting to discuss various filmmaking techniques with everyone. 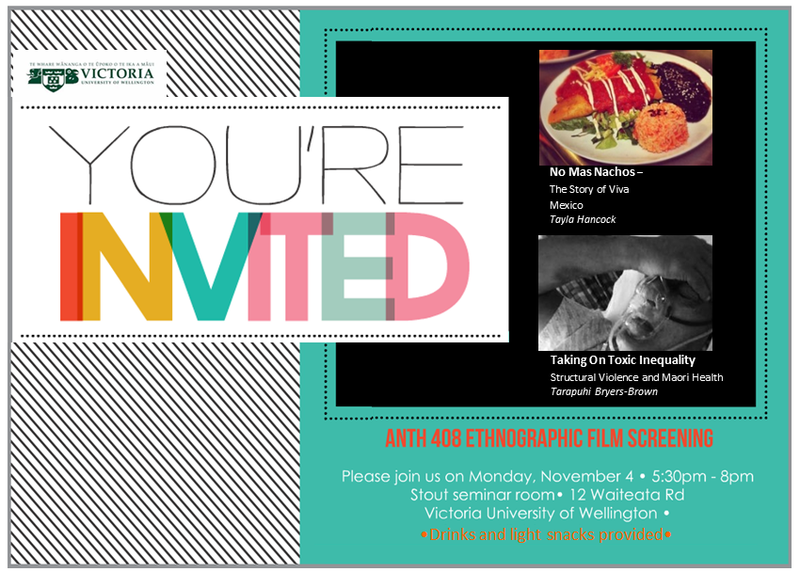 If you’re in Wellington, come along! I’m going to the AAA in Chicago this year and am keen to meet other blogging and tweeting anthropologists. There are a few of us here in New Zealand and it will be great to meet others from all over the place! I’m not presenting on digital anthropology but will blog and tweet from the conference as I can. Lots of people want to turn their thesis into a book. This is not always possible – not all theses make good books. But it may also not be desirable. Some disciplines revere the scholarly monograph so writing one may be very good for the career. But others hold the peer reviewed journal article as the gold standard; in such cases, it may be better to get stuck into turning the thesis into a set of papers, rather than sweating over a manuscript. However, if you do want to do the book business, then you have to think about what the common advice – this book is not your thesis – actually means. The first and most important difference relates to purpose. As I mentioned in my first post on using social media in teaching, I use Twitter (and all social media tools) within Victoria University’s Blackboard learning system. This is because students all have access to Blackboard, to campus computers, and to the internet on campus. I don’t expect students to sign up to platforms such as Twitter just for my courses. Also, while many of them do own smartphones, iPads, and laptops, I do not assume that they can all afford (or want) to. Blackboard has a clunky interface and is not the sexist learning environment out there – and student feedback indicates that they don’t particularly like it – but keeping everything ‘in house’ for me is a way of ensuring ease of access. I teach a large introductory anthropology course and this year adopted a new learning approach to tutorials inspired by Mike Wesch’s World Simulation. I like students to be active participants in tutorials, which I believe should be distinct from lectures in style and content. Rather than summarising set readings or reviewing the lectures, during tutorials each I have each group engage in a collaborative task to help students learn to use the concepts presented and to prepare for their assessed coursework. I assign each tutorial group to an area on a map of the world and students collectively research and become experts on a real-world cultural group (such as the Trobriand Islanders). Each student chooses a particular aspect of culture to research (e.g., religion or systems of trade and exchange – the list of aspects they choose from aligns with my weekly lecture topics) and works with one or two others to learn all they can about that aspect as it relates to their cultural group. In this way, tutorial groups build a full ethnographic description of the cultures they are assigned. Each student then writes an ethnographic essay based on their aspect of culture which is individually assessed – this is not a form of group assessment. 1. Wikis contain a crowdsourced list of relevant references. This is a research exercise and students are expected to find at least one unique academic resource on their aspect of culture. I encourage them to share relevant resources (by listing the full reference and providing a brief summary of its contents) on their group’s Wiki on Blackboard. When everyone in the tutorial group does this, they build a collective repository of approximately 20 resources they can draw on for their ethnographic essays and other coursework. 2. Wikis become a valuable resource for their coursework. Part of the essay requires students to discuss how the particular aspect of culture they are focusing on is integrated with the other aspects of their cultural group (e.g., the role of religion in systems of trade and exchange). They do this by participating in tutorials on a weekly basis. The Wiki lets them continue these conversations and work on their essays outside of the classroom setting. When everyone shares their research findings on the Wiki, they collectively build a full ethnographic description of the cultural group they are studying. The Wiki becomes their first ‘go-to’ place when they write their individual essays and prepare for other assignments. 2013 was the first year our class worked with Wikis and I received some wonderfully critical and constructive feedback from students about how to ‘tweak’ the exercise for next year. I am currently processing this feedback and rewriting the collaborative tutorial group instructions for 2014. Do you (as a student or teacher) work with Wikis on Blackboard? What have your experiences been? What might you do differently (or keep the same) in the future? Seems I’m not the only one who likes the name anthropod! * The Society for Cultural Anthropology has recently launched a podcast series dedicated to interviewing cultural anthropologists about their work and experiences in the field. The two podcasts available so far feature interviews with Michael Fisch (episode 1) about his research on commuter train suicides in Tokyo, and Richard Handler (episode 2) about how he helped to found the graduate Global Development Studies programme at the University of Virginia. Both Fisch and Handler have recently published articles on these topics in the journal Cultural Anthropology, and the podcast links to those articles (one is available through open access, the other is behind a paywall). I was pleased to discover that the interviews don’t simply repeat what is in the articles; instead they provide the anthropologists with an opportunity to talk about their work in a more informal manner. I enjoyed hearing them enthuse about their work, discuss the challenges of fieldwork, and talk about how they developed their research projects and theoretical frameworks. Prof. Handler’s interview in particular was thought-provoking because of my own research interests in development, and like him I have found a lot of anthropology students are keen to work in the field of development. The SCA promises more podcasts featuring interviews like this as well as shorter snippets explaining what anthropology is and what anthropologists do. If these first two are anything to go by, I will be a regular subscriber.